The Solar Umbrella consists of 24 LED lights embedded in the inner upper poles in a special patented construction. The solar panel is discreetly mounted on top of the canopy; no extra wiring is needed. 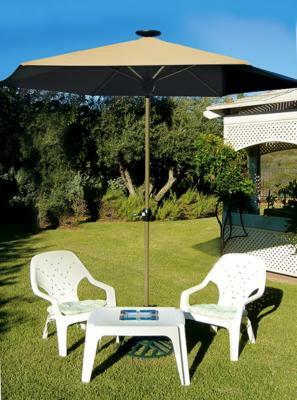 The Solar Umbrella automatically lights up once the sun goes down. It includes a rechargeable battery that charges during the day to provide up to 8 hours of light at night. • Use at BBQs, cookouts and more. • 24 white LED lights. • Base stand as shown not included. • 9 feet high x 9 feet wide.